You may falsely believe that if you want to remove your iPhone backup password but forgot the password, the only thing you can do is to force the phone into recovery mode and restore it as a new device. And you must be very sad about losing all your personal information such as purchased music, TV shows, apps, photos, Contacts, Messages and more. You do not have to be sad. The fact is that you could use a very efficient way to remove password encrypt iPhone backup. It's quite simple and easy. The tool we are about to use is called iPhone Backup Password Remover – a user-friendly tool designed to help users quickly disable backup password for iPhone inlcuding red iPhone 7/SE/6s/6/6 Plus/5S/5C/5/4S/4, iOS 10.3/9/8/7, etc. If you want to disable iPod backup password or remove iPad backup password, this tool works as well. Below are the steps of using this tool. Click "Open" and the program will automatically detect and find directory of the key container file for you. What you need to do is a few clicks to finish the importing. 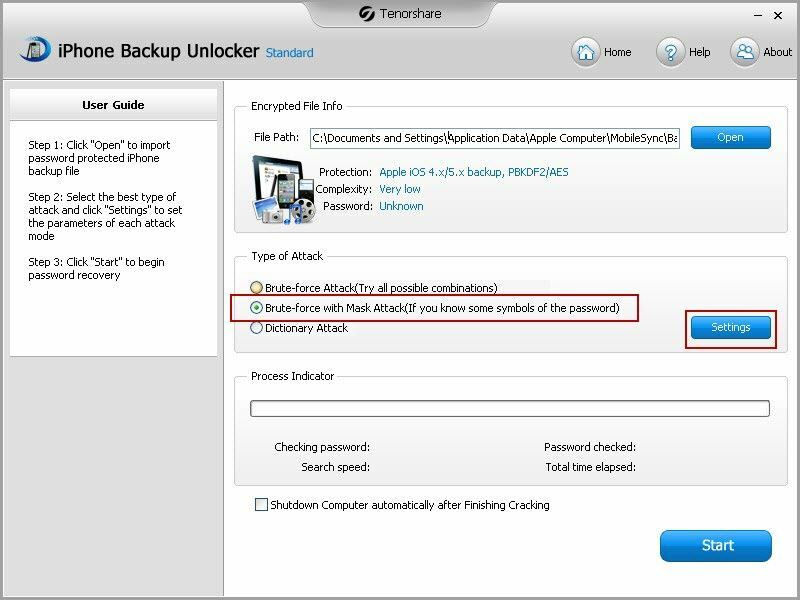 This iPhone Backup Removing software provides you three types of attacks to choose for the program to remove iPhone backup password: Brute-force Attack, Brute-force with Mask Attack and Dictionary Attack. Then you are required to define the attack type you just selected. For example, if you want to use the Brute-force with Mask Attack the steps to operate are shown in the following pictures. Next you should define the settings for Brute-force with Mask Attack. As in the picture below, you have the "Password Length Options", "Character Ranger Options" and "Affix Set" to set. You do not need to set all of them. Set these options according to how much you could recall of the lost password. The more you could set the faster the program works in the process of removing iPhone 5 backup password. Remember that you could click "Shutdown Computer Automatically after Finishing Cracking" on the bottom of the interface, which would save you a lot of time, especially when the password is long and complicated. If you remember your iPhone backup password, you could use the following steps to remove iPhone backup password. 1. Connect your iPod or iPhone to your computer and then open the iTunes on your computer. 2. On the left hand column of the iTunes interface, find "Devices". Locate your iPhone, which will appear as the name you gave it. 3. The picture below is part of the right hand column of the iTunes interface. You will find a "√" for "Encrypt local backup", and you need to click, which will make the "√" disappear. 4. Then enter your password in the popup window shown as below, and click "OK". And then you will find the "√" in the picture above disappears, meaning that you have successfully removed iPhone backup password in iTunes.